Samsung was reported by Korean media this week to be working with multiple brands on bringing a folding display ecosystem to market along with its first folding-display phone. That phone was rumored to be called Samsung Galaxy X, and unlike when Samsung launched the Galaxy Note Edge, they’re not taking any chances. This time they’re working with Xiaomi, Oppo, and others for launch. Samsung is split up into a variety of different companies with similar names. Samsung Display is separate from Samsung mobile, for example. But when Samsung mobile needs display panels for their new Samsung Galaxy smartphone, Samsung Display is ready to provide. 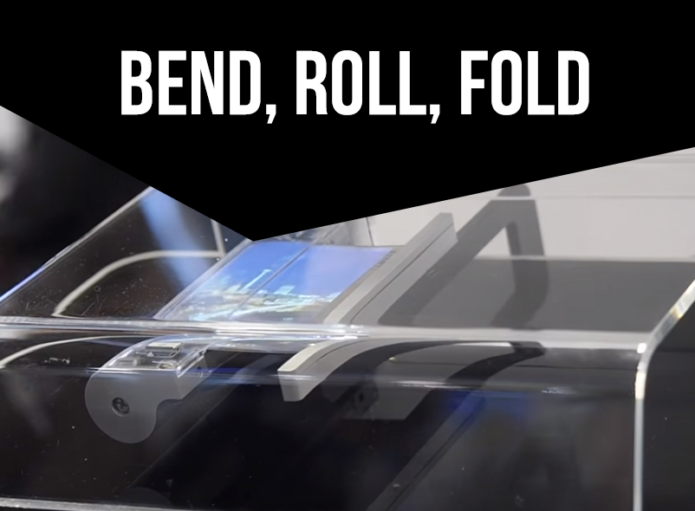 With the Samsung Galaxy Note Edge, that meant supplying bendable displays to Samsung Mobile. According to ETNews, industry sources suggested that Samsung Display is attempting to work with multiple companies at once with foldable panels. They’re doing this, said these sources, to create a market where no market existed before. These sources suggested that the A3 line and the A2 line (Samsung Display) in Tangjeong, Asan City, Chungnam Province, are “under consideration” for the expansion of production of foldable panels. Samsung was said to provide display panel samples to Oppo and Xiaomi and likely others in China. This suggests that Samsung is not only ready to move forward with their first foldable panel smartphone, they must also be confident that theirs is a step above the rest. Samsung wouldn’t want to be caught out in the cold with a less-than-best product here at the birth of this new market – as confirmed by DJ Koh,president of Samsung’s mobile business: “We wouldn’t have started [the project] if it was a going to be a one-time thing.” Since Xiaomi, Oppo, and Samsung are part of the currently hyperspeed-fast smartphone market in China, this means there’s little doubt we’ll see multiple folding-display smartphones in 2019. Which folding display should I buy? If Samsung is the first and only display-maker bringing folding panels to the market, there’s a good chance Samsung Mobile has a leg up on the competition when it comes to software. Much like the Samsung Galaxy Note hasn’t seen a major competitor since it launched, all those generations ago, Samsung might be in a prime position to command the folding panel phone. Have a peek at the timeline below for a few clues on what Samsung might bring to the folding panel when it launches in 2019. Cross your fingers for functionality over fluff! ALSO NOTE: It’s been tipped that the Galaxy X MAY be revealed at CES 2019 – but that’s looking less and less likely as we approach Winter. There’s also a possibility that MWC 2019 might be the place where the Samsung Galaxy S10 is launched. If that’s how it goes down, it wouldn’t be a major shock to see the Galaxy X given a tiny teaser at Samsung’s event in Barcelona, followed by a release of Galaxy X in the second half of the year.